One of the things that makes wallpaper so difficult to remove is the very thing that holds it up in the first place: the adhesive glue or paste. This sticky substance is so strong that it ensures the wallpaper will stay in place for as long as 30 years, making removing it rather difficult. Although some people try to manually strip the paper off by pulling on it or wedging a spackler or paint scraper between it and the wall, home improvement experts find that it may be easier to lessen the effectiveness of the adhesive. This is done by introducing moisture, extreme heat or fabric softener into the wallpaper. The extreme heat that an iron produces in the form of steam or hot water has proven to be extremely effective in loosening up wallpaper, allowing for its removal. Dampen the wallpaper with hot water. Using a steam or cloth iron, fill the iron with a moderate amount of water, depending on its individual settings. Once the iron is hot, place the iron close to the wallpaper and turn it on the steam setting. If an inadequate amount of steam is coming out, hit the steam button a few times to produce short bursts of steam. You may notice the wallpaper moving slightly away from the wall or taking on a wrinkled appearance. This means the steam is working and has in fact loosened the wallpaper adhesive. With the hand that is not handling the iron, pull or use a paint scraper to guide the wallpaper off the wall. If the paper fails to loosen, you may have to apply more hot water to it. Be careful not to set an extremely hot iron right onto the wallpaper, especially if the paper has dried, as this can damage the wall and may even burn the paper onto the wall. A professional wall steamer can be rented from a supermarket, hardware or home improvement store if you feel that you want to run the machine directly over the wallpaper. 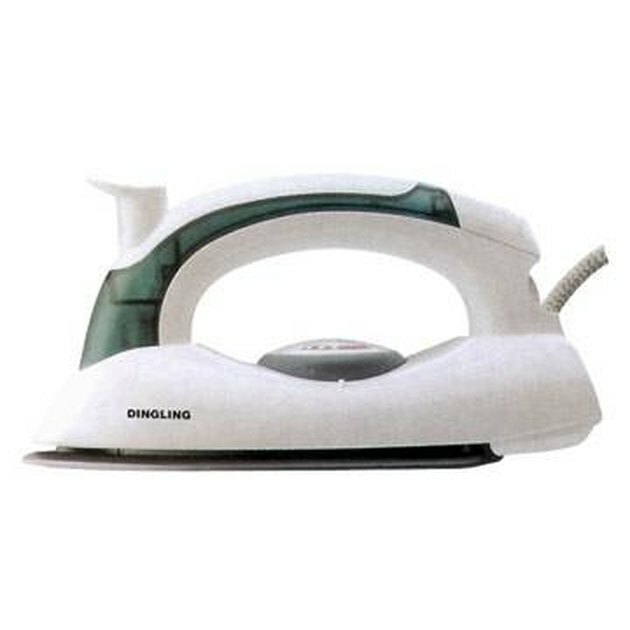 Irons produce a significant amount of steam and heat, which can easily burn a person's skin. Remember, too, that maneuvering an iron on top of an ironing board is different than trying to position one parallel to a vertical wall. There will not be anything under you, such as an ironing board, that will stop the hot water from dripping on you. Therefore, you should wear practical shoes and pants when handling the iron. You may also want to protect your hands with rubber, not plastic, gloves. Rubber gloves have a higher tolerance for heat than plastic does.